Over the years, we've been hugely impressed by the creativity demonstrated by by teams' video missions during The Classic Go Game. Inspired by these experiences, we're proud to present The Movie Game -- a blockbuster of a team-building activity. 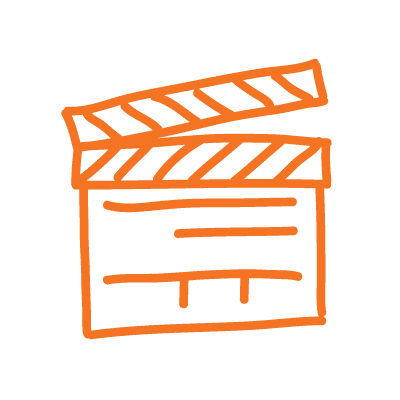 You and your co-workers become a powerhouse movie production team, complete with directors, cinematographers, actors, costume and sound designers, all collaborating to create short films that will bring the roof down. The Movie Game is the perfect way to get creative, run around in a crazy costume, all while staying inside your office or conference area! Part Oscars MC and part college film instructor, your Game Producer will get the event going with a hilarious and high-energy introduction. The gear, the roles, and the structure of the game will be clearly spelled out so teams can hit the ground running. During the course of play, teams are given a movie genre (like 'Coming of Age,' 'Horror,' 'Mockumentary,' 'Romance,' etc.) along with prompts to build the story and keep it going at a perfect pace. Magic happens when teams fill in the blanks of the storyline. Believe us when we say the results are nothing short of genius. The game ends in an all-out Academy Awards style ceremony, presented at the ending venue of your choice. Hosted by your Game Producer (Tina Fey is notoriously hard to book), the movies are screened and we'll help you judge them, supported by food and drink. You'll vote for 'Best Director,' 'Best Actor', the coveted 'Best Picture' and a host of other categories. Solid gold plastic awards are presented to the winners recognizing the myriad talents of your group.